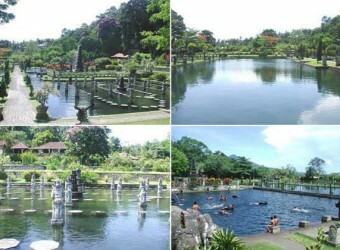 Tirta Gangga is in Karangasem. It is the unique palace of mixed European, Chinese and Balinese architecture which was built in 1948. On the south side, there is the tower and pond of headspring, and on the center, there is a swimming pool where people can swim. On the north side, there is the palace for resting place which is very fantastic like a beautiful park. I was surprised there were a lot of people. I wondered if there were many Western tourists. I watched kids swimming in the pool. It seemed fun. This place is also popular for local couples.